Where is the solution to the golf payment conundrum? 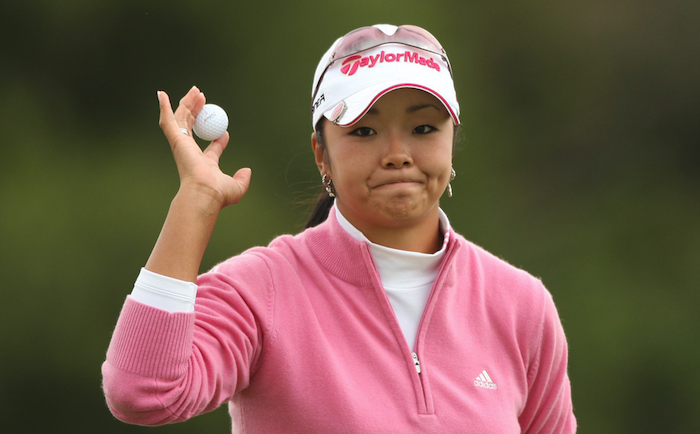 The debate has raged for years but the reality remains that women pros earn a lot less than men and there’s no obvious solution in sight, writes GARY LEMKE in Compleat Golfer. There’s a simplistic explanation why men’s professional golfers earn considerably more in prize money than their female counterparts. But best you stay away from any sharp objects and clear the area of any cups and saucers while the point is being made. The story goes: Men earn more because more people watch men’s professional golf than women’s golf. Therefore the TV networks can charge advertisers more to have their adverts flighted. Because of the media interest, more sponsors are drawn to the men’s game and they are charged more to be associated with it. Increased revenue for the men’s game allows that revenue to be shared among the golfers, which means they earn more. The end. Male caddie Austin Johnson (Dustin Johnson) out-earns all but the top four on the LPGA Tour. The average top-10 woman golfer earns $274 per shot. For the men it’s $1 141. Rank No 40 in male golf earnings (as Zach Johnson did in 2017), and you’ll out-earn the top woman. Rank No 86 in male golf (as Morgan Hoffmann did in 2017), and you’ll rank in the top 10 among women. Tennis is used as a shining example of where golf has got it wrong. At all four Grand Slam events there is equal prize money between men and women. That flies in the face of golf’s argument – and to be fair, the commercial reasoning for the gap applies to most sports and tennis is actually an exception to the rule. There’s an annual argument that tennis has actually got it wrong. Men generally spend more time on court (because they play best-of-five sets, compared to best-of-three), which means they generate more TV revenue and even the price of tickets is set higher when it comes to watching the men than the women. But golf doesn’t have a great reputation when it comes to equality. The R&A, which runs the sport worldwide along with the United States Golf Association, only opened its membership to women in 2014 – the first time in 260 years – while Muirfield, one of The Open Championship hosts, voted to end its male-only membership policy in 2017. And Augusta National, home of The Masters, invited women to join in 2012. So the chances of them being dragged into the 21st century and addressing the gender pay gap seem remote. However, the R&A is adamant progress is being made. In reality, though, it’s a subject that is raised at least once a year, especially around the time of the men’s Open, when journalists are afforded an audience with the powerbrokers. And this is how the 2018 interview went. At Carnoustie, the total prize money was $10.5-million but the purse for the women’s equivalent in early August was only $3.25-million. The R&A said the way to address the imbalance was to focus on the amateur game. ‘Our primary objective is to make sure our game is thriving 50 years from now,’ chief executive Martin Slumbers told reporters. ‘The growth of women playing golf, women working in golf and families playing golf is critical to the long-term growth of the amateur game. ‘If I look at the UK, the most frightening statistic I’ve seen is that between 2016 and 2017 the average age of club membership went from 54 to 58 years of age,’ said Slumbers. ‘That is a significant problem we have to face, so our Women in Golf Charter is one of our major planks of trying to get the amateur game to grow. We absolutely want to drive up the prize money for the Women’s British Open … but if we can grow the women’s amateur game, that helps the business model at the top end. That’s what we are trying to achieve,’ Slumbers added. ‘Professional golf is a business, a business about how much revenue comes in from TV, from sponsors, and then you balance that against how much it costs to stage the event and how much you pay out in prize money,’ he said. And with that, the caravan was packed up and put away for another year. Or, at least that’s how it would feel to those impatient for change and wanting to see tangible progress. Those who use tennis’ Grand Slams as a yardstick for gender prize money equality also point out that the cause is helped by the men and women playing in the same tournament, at the same time. Scheduling on the golf circuits and Tours is so tight that it’s difficult to bring the men and women together during the year, but if tennis can do it for four fortnights a year, could golf not try something for four weeks of a year? Let’s ignore the fact for now that there are five women’s golf Majors. Back in 2014, the USGA held the men’s and women’s US Opens on the same course, Pinehurst No 2, on back-to-back weeks. More than 340 000 fans attended both tournaments. Michelle Wie’s victory earned her $720 000, which was 44.4% of Martin Kaymer’s winnings of $1.62-million from a week earlier. In 2015, the US Women’s Open at Lancaster Country Club set a record with 134 016 spectators. Due to the capacity limits at the men’s US Open (Chambers Bay could only hold about 30 000 daily) 14 000 more fans watched the women than the men. But when Jordan Spieth won the men’s US Open with a four-round score of 275 and In Gee Chun won the women’s tournament with 272, the USGA awarded Chun $810 000, 45% of the $1.8-million it signed over to Spieth. The voice of South African golf, Dale Hayes, spent time recently at the men’s Senior Open and the Women’s British Open, both events being played on the same Royal Lytham & St Annes course. And what he saw impressed him. ‘The golf played by all the ladies had to be seen to be believed. The big plus is that they play so much faster than the men. There’s no messing around and no conferences with caddies. Just golf, the way it was meant to be played. I’m officially a fan of women’s golf,’ he said. Now, just to finally address the elephant in the room.